A drawing of the type specimen’s skull and fang. Desmodus stocki was 20% larger than the still extant common vampire bat (Desmodus rotundus), and it was probably adapted to a cooler climate. This creepy creature seems an appropriate enough subject for Halloween week. It’s perhaps the most surprising and strangest animal included in the list of species that occurred in southeastern North America during the Pleistocene. Fossil evidence is scant but sufficient to suggest it lived throughout the entire region. 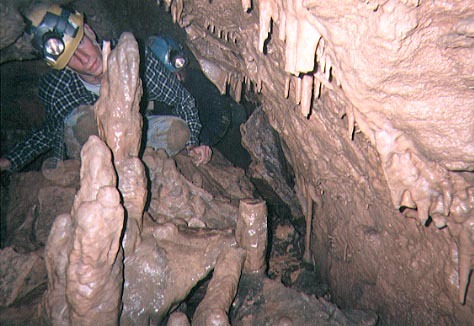 Photo of a caver inside New Trout Cave, West Virginia. Pleistocene vampire bat fossils were found here. Fossil bones of the Pleistocene vampire bat have been found in Cuba, Mexico, Florida, Texas, Arizona, northern California, and West Virginia. The latter two sites are about the same latitude. The fossils from New Trout Cave, West Virginia date to 29,000 BP, a time of a weak interstadial preceding the Last Glacial Maximum. Modern vampire bat species can’t survive temperatures that fall below 50 degrees Fahrenheit. Some scientists think winter climates during the Ice Ages were milder south of the ice sheet than those of today, explaining why vampire bats were able to live this far north, but I don’t agree. The species of plants inhabiting the south then were temperate and in some areas even boreal. 29,000 years ago, the Laurentide Glacier was very close to New Trout Cave, so winter temperatures must have consistently been below freezing here during winter. Pleistocene vampire bats were probably able to survive cooler temperatures than their modern cousins. Pleistocene vampire bats enjoyed an abundant supply of food, likely gorging on the blood of giant ground sloths, mammoths, mastodons, bison, horses, llamas, peccaries, bears, big cats, wolves, and maybe even paleo-Indians. There’s no direct evidence proving they fed upon the blood of these victims, but I think it’s a safe assumption they did. Their bones have been found associated with giant sloth remains, though this doesn’t really count as proof. They did occur on islands where the only large mammals were dwarf ground sloths, making it certain they must have plagued the latter. Vampire bats require lots of blood (their sole source of nourishment) and will die, if denied food for more than two days. To survive a shortage of food, they share blood by regurgitating it to each other. I think the reason Desmodus stocki is not more commonly found in the fossil record is because they usually roosted in hollow trees where their remains would decay into nothingness along with the wood and leaf litter of the forest. The extinction of Desmodus stocki paralleled the extinction of the megafauna. They were a commensal species that couldn’t survive the loss of such an abundant source of blood. A population of Pleistocene vampire bats persisted on San Miguel Island off the coast of California until 3000 BP, indicating pygmy mammoths inhabited the island til then. Best photo of a common vampire bat found on google images. Today, there are at least three kinds of vampire bats and all inhabit the tropics of South and Central America. The white winged (Dianus youngi) and the hairy legged (Dyphylla ecaudata) both feed upon the blood of birds. The common (Desmodus rotundus) feeds upon the blood of mammals, and its numbers have skyrocketed since the introduction of livestock to South America. Diseases carried by vampire bats cause the deaths of hundreds of thousands of cattle and horses every year. The same must have been true of the megafauna during the Pleistocene. The rate of rabies must have been high in that primeval world. However, it’s unlikely this contributed to any extinctions because vampire bats and megafauna co-existed for millions of years. 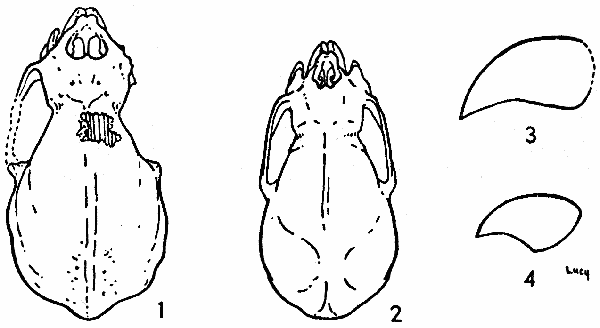 A fourth species, the giant vampire bat (Desmodus draculae), may still be extant. Scientists dated a fang of this species found in Argentina to be just 300 years old. It’s the only bat fossil of any kind found in Argentina. Other fossils of this species have been found in Brazil and Venezuala and date to the Pleistocene. Cattlemen occasionally report seeing exceptionally large vampire bats feeding on their stock. Cryptozoologists are on the lookout for it. In this case they may be chasing a real species, not an imaginary one. Vampire bats evolved during the Miocene, at least 8 million years ago, probably from bats that specialized in eating either ticks or maggots living on open wounds on large mammals, much like African oxpecker birds do today. Evolving from eating maggots and/or ticks to consuming blood required only a few inherited mutations. The legend of the vampire predates the European discovery of the vampire bat by at least 500 years. The English word, vampire, was derived from the German vampir in 1734, but the German word can be traced back to the Russian word, uper which dates to 1047. Ancient Babylonian legends include tales of blood-sucking ghosts, predating the origin of the Russian word. Europeans didn’t discover the existence of vampire bats until 1526 when an early Spanish explorer awoke and found one sucking blood from his toes. This entry was posted on October 24, 2011 at 1:51 pm and is filed under Pleistocene Mammals, Uncategorized. You can follow any responses to this entry through the RSS 2.0 feed. You can leave a response, or trackback from your own site. How large would the giant vampire bat have been? Wingspan and weight? Recently, a Mexican immigrant to the US died of rabies that was apparently inflicted by a bite of the vampire bat while he was sleeping. You caught the one fact I forgot to include. I don’t know the wingspan, but the giant vampire bat was/is ~30% larger than the common vampire bat. I think there’s a good chance this one isn’t extinct. Vampire bats are nocturnal. It may be that a rare nocturnal mammal in the Amazonian jungle is hard to collect. I have read that D. draculae had a wingspan of about 50 cms. Don´t know how reliable this information is, though. Where I live there are still vampire bats, sometimes they roost amazingly close to the city; a young girl recently died after being bitten by a vampire bat.